I recently went over to my sister's for dinner, and among other things she made me the most gorgeous salad. We're both huge fans of Ottolenghi and have spent many hours perusing and cooking from the cook book. This is Ottolenghi-inspired, so apologies to both the restaurant and my sister for tarnishing their names! For this recipe, I used my ever-trusty George Foreman grill, but you can get similar effects using a grill pan. Slice the courgettes in half both sideways and lengthways, then cut into 7mm ribbons. Grill for approximately 5 minutes and set aside. Put some water on to boil and then snap the woody ends off the asparagus. Chop them in half so you have two shorter stems and then blanch in boiling water for 3 minutes. Making sure to reserve the water, remove the asparagus using a slotted spoon and then put them in the grill to chargrill too - this should also take about 5 minutes. Add the green beans to the reserved boiling water and blanch these for 4-5 minutes. Once done, drain and run under cold water to cool and retain the colour. Transfer all the ingredients to a serving bowl and drizzle with a little olive oil. For the garlic yogurt dressing, put the yogurt and olive oil in a bowl and fold together until emulsified. Put the saffron strands in a heat-proof bowl and pour over about 2 tablespoons boiling water. Allow to infuse for about 20 minutes before adding the liquid to the yogurt. Again, fold this in fully. Finally, crush 2 cloves of garlic into the yogurt, stir, and allow to sit for 10 minutes before drizzling over the vegetables. 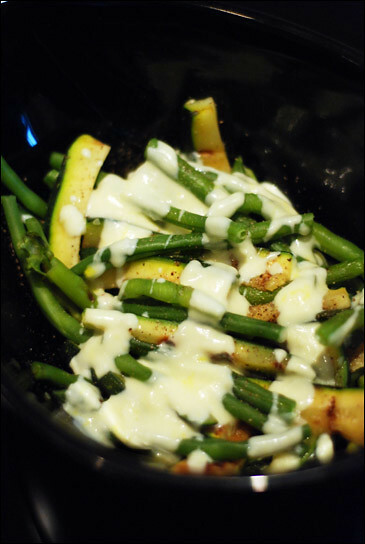 You should have a beautiful, pale golden sauce which complements the grilled vegetables beautifully.